UPDATE-Lagos State To Host The Third Edition Of The Africa Music Awards (AFRIMA). ​The African Union Commission (AUC) has announced Lagos State as the official Host City of the third edition of The All Africa Music Awards. The announcement ceremony, which took place at Protea Hotel, GRA, Ikeja in Lagos on Monday August 15, 2016, amidst pomp, was attended by officials of the African Union; members of the international committee of AFRIMA; AFRIMA 2015 winners; top government functionaries; stakeholders in the creative/ entertainment industry in Africa, media executives, and musical artistes. To give the acceptance speech on behalf of the the Governor of Lagos state, Mr. Akinwunmi Ambode, was the Lagos State Commissioner for Information, Mr. Steve Ayorinde and Special Adviser to the Governor on Culture, Mrs. Adebimpe Akinsola. 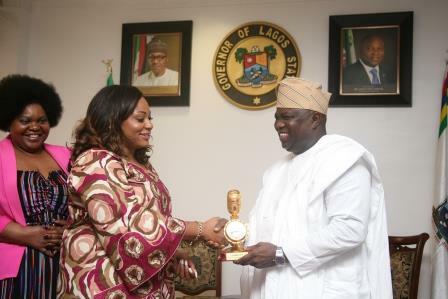 In his speech, Governor Akinwunmi Ambode, expressed delight at emergence of Lagos State as the official host city, said the state would not only throw its weight behind All Africa Music Awards, AFRIMA and partner the African Union but also provide facilities and infrastructure to make AFRIMA 2016, tagged AFRIMA 3.0, a success. Explaining why Lagos would support AFRIMA, Governor Ambode said African Union’s vision aligns with Lagos State’s. 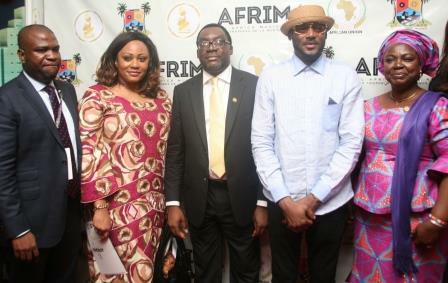 He said, “The reason why Lagos State is partnering with AFRIMA should not be far-fetched. More importantly, the vision of AFRIMA is a veritable platform to celebrate the best of talents in African music industry which aligns with the vision of the African Union to foster peace, unity and development through cultural expressions and creative enterprise. “Moreover, these values are also in sync with the Lagos State vision of being an undeniable entertainment capital of Africa, as well as being the hub of creative expressions in the continent. The aim is to open up the state for performing arts to blossom and we are ready to partner with credible organizations to ensure that Lagos remains the destination of choice for arts and entertainment, for artistes and for those who make the business of arts to thrive. Highlighting the activities of the 15-month-old Ambode-led administration, the Ambode government, which is mindful of excellence, has demonstrated undeniable commitment to promoting artistic project in order to promote the state as one with an artistic soul. Moreover, the AU officials, AFRIMA officials and some artistes later paid a courtesy visit to the Governor’s office in Alausa, Ikeja Lagos. 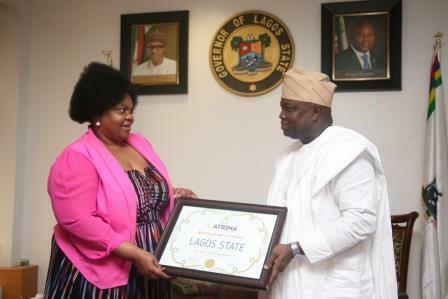 Thanking the Lagos state government for accepting the right to host AFRIMA 2016, AU Head of Culture, Angela Martins, also commended the state’s support artistic enterprise.“This is a great achievement for Africa which also promotes the development of culture and an advancement of the creative industry,” she said. In response, the Lagos State Governor Mr. Akinwunmi Ambode welcomed the guests especially the artistes and AU officials who he said were visiting him for the first time. 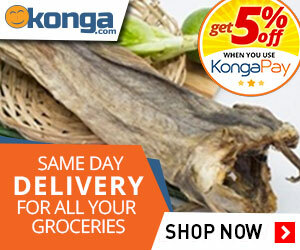 He also promised that Lagos would always be in support of the arts, culture and entertainment.